Nancy, thanks for the positive feedback. It’s much appreciated! Let me wish all of you a wonderful Passover. Because of this website, I am living a more meaningful religious life. Maybe 30-60 minute seder. This include Barech, Hallel, and Nirtza which can’t be done in 5 minutes (after doing everything else). Unless of course, you’re one of those who davens at the speed of a sneeze. I so thoroughly agree with Mark on this post and how he has presented it that I can’t believe he’s getting any grief about it at all. The unruly participants need a guide to the five-second rant. When people know something is short, it is more likely they’ll pay attention. Ideally all Jews should be spending 2-5 hours at their seder. But unfortunately some people are only willing to spend 5 minutes on the religion part at this point in their lives. The secular friends who I grew up, and who I reconnect with on a dedicated Facebook account, asked for a 5 minute seder. So I prepared it and named it to fill their request. They weren’t interested in Seder 101; they can already find that on the Internet. Also, the above sequence of events, however abbreviated, doesn’t sound as if it will take only five minutes. In my house at least, the arguments (especially with the kids but sometimes the adults too) about who sits where, and next to whom, can take a good fifteen minutes before we even start the Seder. Pouring wine…arguing about what wine to drink….drinking it….the matzah and marror eating, with everyone complaining about the amount of matzah handed out and who got served first….dinner….how in the world will even this highly abridged Seder take less than an hour to complete? I can’t see how a short seder with valuable content could possibly be considered negative when the alternative is either no seder or a longer seder without the valuable content (or with valuable content, but presented in such a way that the recipients can’t or won’t absorb it). Exactly who is the right crowd for the 5 minute seder and how one determines whom to present it to are legitimate questions that need to be addressed, but it’s clear to me that the idea is worthwhile for some of the people out there. Judy, AF – The 5 minute seder was written for non-observant people who will be having their own seder without the assistance of anybody who knows how to run a mesorah-based seder. I tend to agree with Judy that the best approach for combining legit/for-real with not-interminable is that of Chabad. When I have gone to Chabad seders, I have always found that I move along a bit slower because I am reading everything (and I can’t yet read at the blitzkrieg pace of Chabad shluchim). But the fact that the rest of the train is chugging along at 130% of my pace is never a problem. I just keep up as best I can and catch up as best I can where I was unable to keep up in the first place. The result is that there are people in the room who are doing everything really fast (the shaliach and his family), people in the room who are doing less than everything really fast (the more inexperienced folks), and people who are doing everything relatively slowly (me and other similar folks). How long should the seder be, according to mesorah/tradition? People are asking for a short Seder because they have learned to intensely dislike it, so that the thought of having to sit through one has become about as appealing as undergoing a root canal. The key then is NOT to shorten the Seder, but to make it enjoyable. You’re talking about individuals who have no problem sitting through lehavdil a four-hour Super Bowl game show or a child’s graduation ceremony with all the speeches and presentations. I think that Chabad has done a very nice job of making community Seders which are meaningful without seeming interminable, and yes last a lot longer than five minutes. The Haggadah itself with its songs and participation seems to have been designed by Chazal to keep bored children interested in what is going on. 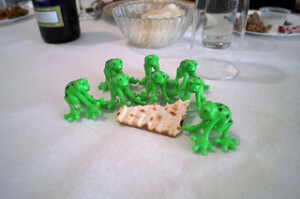 Many families personalize their Seders with “shtick” like toy frogs, turning it into a beloved family tradition that grown children remember happily, and want of their own volition to come back to even years later when they are free to choose not to. For the non observant people I know, “the seder” ends before the meal. How long is “Shulchan Orech” in a 5-minute seder? Enough to eat the egg?